That got your attention didn’t it? Well, nobody is more surprised than I am. I thought I was just your average 14-year-old until it happened. Let me explain. I live in Pennsylvania with my mom Chris, dad Brian, and little brother Adam. I’m in the eighth grade, my grades are good, and I love to play soccer. My best friend is Sarah who lives down the street. It’s an all-American apple pie life, at least that’s what I thought until one day something really big happened. It started when Adam went into my room and took my I-pad without asking. Of course, we got into an argument and Mom sent me to clean the attic as punishment. I know I don’t have to tell you what it’s like, somehow the little people get away with murder and we big kids get it in the neck. Anyway, I went up to the dirty, old attic and didn’t even know where to begin. I found this neat old trunk and inside were all kinds of clothes and things I had never seen before. There was a kind of pretty old hat that I tried on and that was it. Zap! I was gone. Outta there! I have to tell you, it was scary. I landed back in the year 1892 in England. Wow, that was a real eye opener! You should see the clothes they wear. They don’t have cell phones, TVs, radios, or computers, absolutely nothing like that. I was confused and frightened and didn’t know what to do. The first person I met was a girl named Lizzy. She was really pretty cool, and she helped me. I don’t think she ever believed that I was from another time, but she was nice and I actually miss her. While I was there, my grandfather watched over me in my dreams. He was awesome. He gave me clues on what to do and it turned out to be a real adventure. I met new people…including a handsome guy who I hated to leave behind, and learned a lot about life at that time. There was a reason for my visit, but I’m not going to tell you what it was, you’ll have to read the book. Even with missing my family and the scary parts, I think I’d like to do it again. I’m not sure how to make it happen, but maybe in the future I’ll get another chance to time travel. About the author: It's never too late! That's my new motto! As a semi-retired grandmother I felt incomplete and wanted more. Amazing what becoming a grandparent does to you. I decided to leave our granddaughter a legacy of words and a simple idea turned into Emerson's Attic, The Blue Velvet. I live with my husband in the mountains of central Pennsylvania where I have put all my other interests on hold so that I can write. It's taken a very long time, but I finally figured out what I want to be when I grow up...an author. Visit me at http://www.kathleenandrewsdavis.com or look for Emerson's Attic at http://amzn.to/13r1lCr to purchase the book. Blurb: Emerson McBride is a normal American teenager. She goes to school, plays soccer, and roams the mall with friends. Her life is just like that of any other 14 year old's until she is sent to clean the attic in the old Victorian as punishment for fighting with her younger brother. Suddenly she is thrown back in time to a totally foreign world. Frightened and armed only with dreams of her grandfather, Emerson ventures into the unknown. How did she get here? Who are these people? Who is she and why is she here? These questions and many more follow Emerson into a new life in a new land. My Review: I requested this book because of it's cover, and ended up captivated by the story inside. Emerson is 14 years old and typical in every way, until she gets into trouble and sent to clean the attic in her Victorian home. She opens up an old trunk and tries on a blue velvet hat, and soon finds herself in 1892 at an English country manor. Hidden passageways and secret doors lead Emerson (now known as Emma) on the adventure of her life with only dreams of her grandfather to guide her. There is a very cool twist at the end, too! This book is completely original and perfect for readers of all ages who enjoy YA, mystery, romance, historicals, or time travel. I understand the next book in the series is coming out in a few weeks and I can't wait to see where Emerson finds herself next! Giveaway: The author is generously offering a print copy of Emerson's Attic: The Blue Velvet to one lucky reader. Simply leave a comment with your email address; US entries only, ending March 21st at noon eastern. Sounds like a cool book. 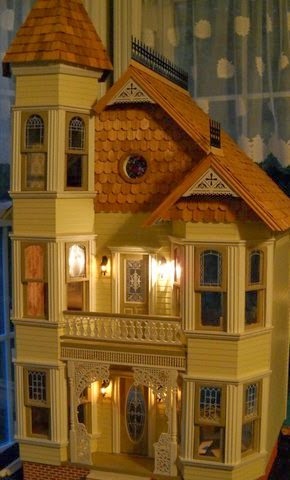 My Aunt Pauline wouldn’t let her cats anywhere near her doll house. 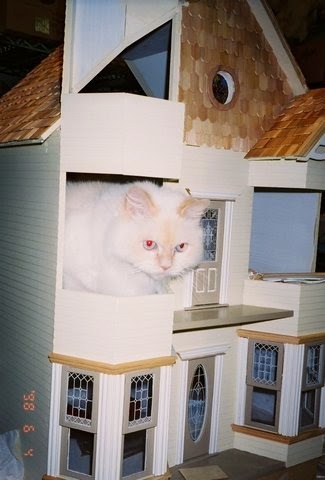 I'm impressed that the dollhouse can stand up under the weight of the cat! Emerson's Attic: The Blue Velvet by Kathleen Andrews Davis sounds like a interesting book to read, I like time travel books and things in attics can tell us a lot about our history and our families, I think it will be fun to follow Emerson McBride in her journey back to her grandfathers time and what happens. I love books about time travel, and this one sounds like a very fun and interesting book. I would enjoy reading it. Thanks for having the giveaway.